Usually found on slopes with grasses. The marble sized bulbs are edible and good tasting, somewhat like nutty oatmeal. The plants are 6 inches to two feet high, and delicate. To get to the bulb, you must dig carefully, or the stem will easily break, making the bulb very hard to find. If you do eat the bulbs, try to do so after the seeds have matured, to ensure future harvests. Small bulblets the size of a pea are often found alongside the larger bulbs. These should be left in the ground, or planted nearby so as to help propagate the plant. Wild Hyacinth blooms from March to May. The flowers are at the end of long leafless stems, and are from half an inch to two inches across. The flowers are a light blue-purple, with six stamens, attached to the stalk by a very short stem (called a pedicel). The leaves are long and slender, often folded into a tube, and are attached close to the bulb (this arrangement is called basal attachment). 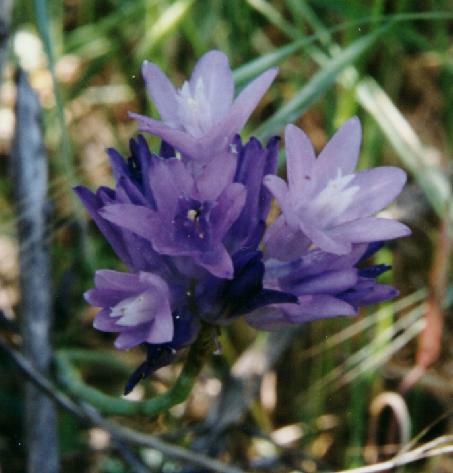 There are ten species of Brodiaea found in the Santa Cruz mountains, although pulchella is one of the most common. The photo above was taken at the Lakeview Bird Farm at 1600 feet elevation on Montevina Road. The specimen in the scan below was collected on the east shore of Lexington Reservoir.